When I throw a party, or do anything really, necessity is truly the driving force behind the creative process. I couldn’t round up the 20 chairs I needed for the kid’s table, so I put the table on a couple of paint buckets to raise it off the floor. Since the kids were going to be on the floor to eat for the party, I needed the ceiling to come down to them and fill that void in the space. 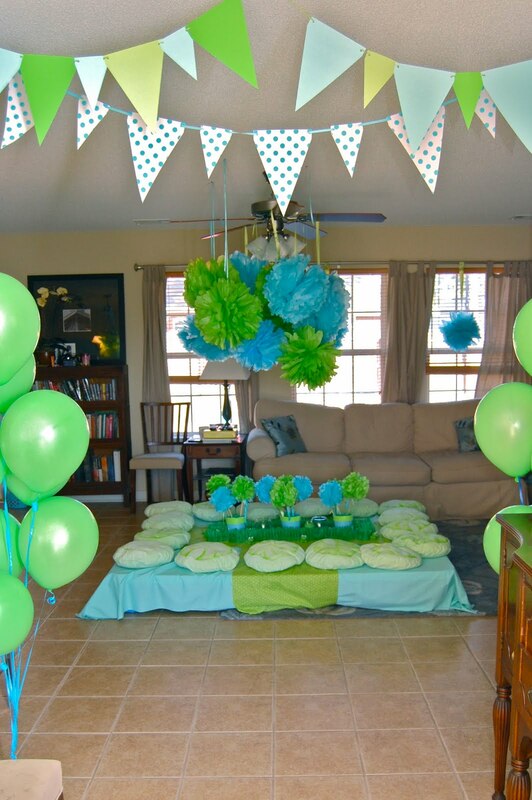 I wanted to give it kind of an under water feel with all the blue and green, and tissue poufs are about as easy as it gets to very simply and inexpensively add lots of color and fill lots of space. My original idea involved a hula hoop and about 100 yards of tulle; my husband was happy I changed my mind. 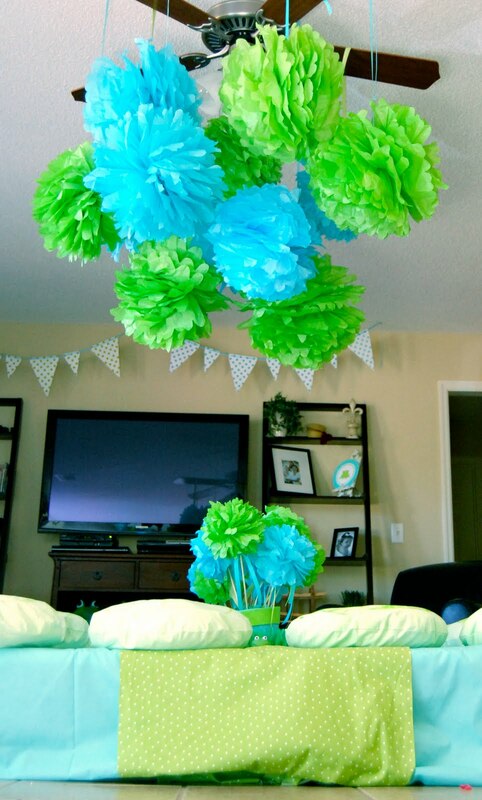 I also used tiny poufs to create “flower” arrangements for the kids’ table. If you use floral wire to secure the centers of the poufs, you can actually easily attach them to shishkabob skewers. Or dowel rods if you want to get fancy. I used what I had laying around. There is floral foam and weights in the bottom of the little felt buckets to keep everything in place. The tablecloths are just lengths of fabric. Admittedly, one of the more labor intensive things I did for the frog prince’s party was make 20 little lily pads for the kids to sit on at their table. I upcycled an old duvet cover; I dyed it green, then sewed, stuffed and painted the tops of these little gems. The good news is that they were enjoyed far beyond the party, as the birthday boy really enjoys rolling around like a little pig in mud in the piles of them. The cake artist crafted the frog out of fondant. She did a great job! hi where did you find the pom pom decorations?? Where did the grass garland come from? Please don’t tell me you made that too!